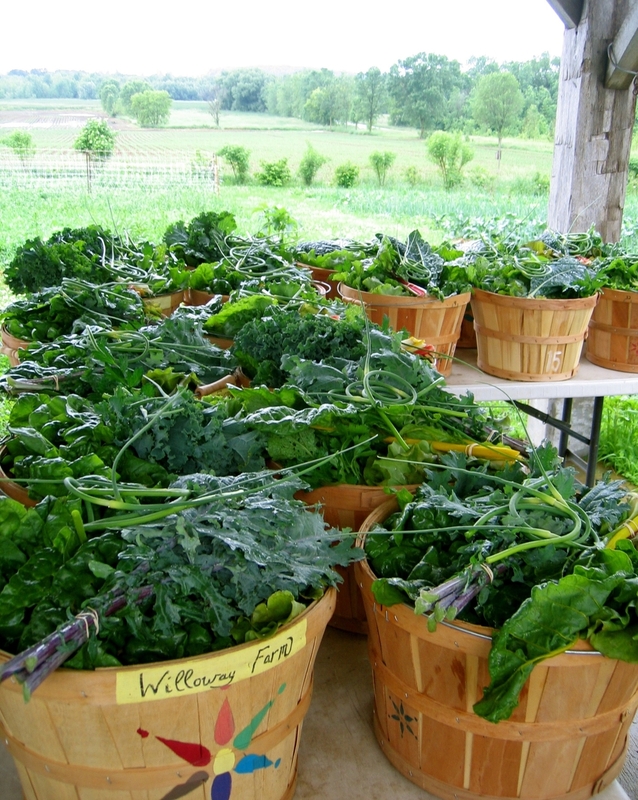 Willoway Farm offers Community Supported Agriculture for our 10th Season! Options include Heirloom Vegetable Shares, Heirloom Flower Bouquet Shares and brown and blue egg shares. Home Delivery for Flower Bouquet Subscription is available. In addition our vegetables, herbs, and flowers can be found at locally at weddings, local restaurants and local shoppes whom support local vendors. Check our events for dinners on the farm! Willoway Farm is a small family farm host to a diverse garden filled with Heirloom Vegetables, Fruits, Flowers and layer chickens north of Milwaukee in Ozaukee County. In addition we put our veggies, herbs, fruits, flowers and native plants into wedding and event floral arrangements. Our farm is dedicated to growing food & flowers with a minimal imprint on the earth, no toxic substances to aid growth, and no GMO used in seeds or fertility. We refuse the uses of herbicides or pesticides and continue to strive for beautiful healthy soil which in turns creates nutritious foods. We use organic, permaculture and some biodynamic principles when we garden. The farm is us two- Daniel and Jacqueline with our 7 year old Sam and 4 year old Summer. We establish our farm in 2007. Albeit we worked on the infrastructure of our farm in 2006 like the irrigation. We chose to start the farm from the ground up by designing, sowing the seeds, nourishing the land, creating and adapting the out buildings for our farm visions. Slowly but surely we now witness the fruits of our labor as the years go by. The 8 acre farm abuts a wetland & flowage of the North Branch Milwaukee River. The farm sits on a south slope of glacial moraine midway between gravely hilltop and overlooking the swampy bottom land below. All produce and flowers are solely produced by us. The produce and flowers are grown on permanent raised garden beds hand shaped and hand fertilized yearly. Native plants are grown throughout the property. Hand tools and human power are our primary source of planting, harvesting and cultivation. We choose this scale of farming because it is what we consider is sustainable for us. Farming in this manner adds to our quality of life, quality of produce, flowers, eggs and quality to our environment surrounding us. We practice permaculture and some biodyanmic strategies which influences our decision to manage the farm as a single biodiverse ecosystem. We select native florals to grow such as elderberries bushes and hazelnuts. We prefer growing diverse heirloom flowers and vegetables which in turn preserve small farms and the bounties of nature. We encourage birds and beneficial insects habitats throughout the farm for instance our bluebird houses in the garden. We are home to a young apple orchard where each tree was grafted every spring since 2007. We chose our preferred rootstock and heirloom apple and pear scionwood . We raise honeybees, diverse types of layer chickens, and a small herd of Finn Sheep. Jacqueline creates floral arrangements for our Flower Bouquet CSA and various Weddings and Events incorporating not only the flowers, but the herbs, vegetables, fruits and other native foraged materials. We recently installed a season extension high tunnel, built to enhance the growing season availability. Willoway Farm has been host to dinners on our farm and have a to be certified kitchen in the works. Please join us in our adventure to grow, create and sustain our vision and our farm.